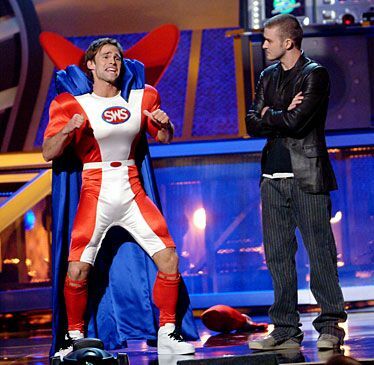 Justin Timberlake tries to figure out where he knows Seann William Scott from as he dances around in his shiny pajamas. X-Men stars Hugh Jackman and Famke Janssen look like nordic sculptures as they present the award for Female Breakthrough Performance. Turns out that it's true that if you get the reputation of being easy, it'll follow you to the grave. Just ask Adrien Brody when he's done frenching Queen Latifah. 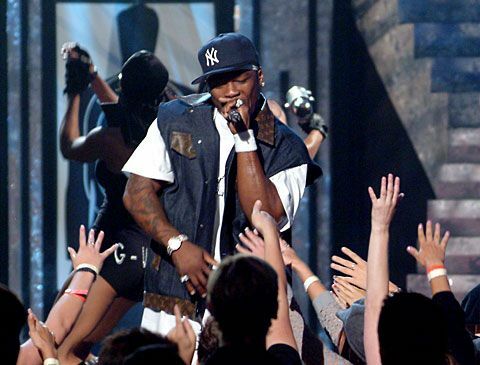 Reinforcing his monopoly on all of music in the summer of '03, 50 Cent brings "In Da Club" to the people live and obviously they go completely mental. 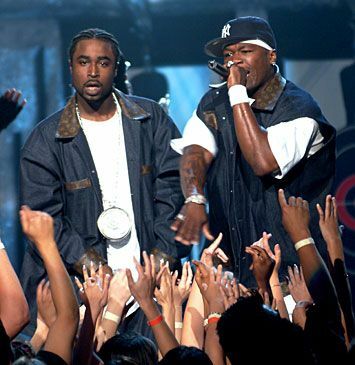 50 Cent's best friend just can't believe how popular they are. Look at his face! He's dumbfounded. 50's too busy rapping about Shorty's birthday to notice. Don't tell him we said it, but that's totally a bionic leg, right? Is that how 50 Cent rhymes so tough? 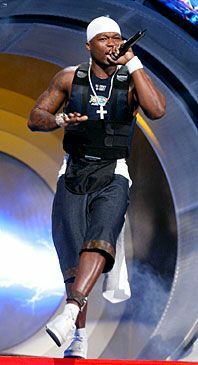 Here he is, still performing "In Da Club." It would probably be better if we left the caption for this smoking hot photo of My Best Friend's Girl-star Kate Hudson up to you, the reader. 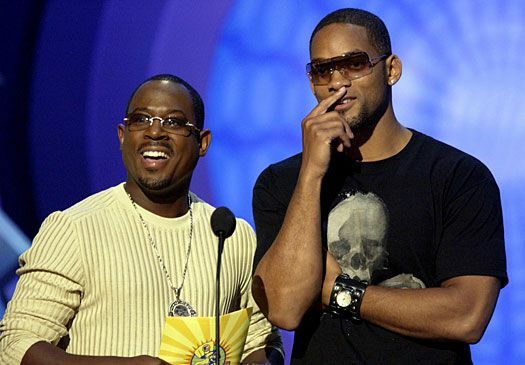 In the process of presenting the Golden Popcorn for Best Comedic Performance, Martin Lawrence and Will Smith shamelessly promote their upcoming movie Bad Boys 2. Is that Jennifer Garner? Looks like her... but the expression is very Pod People... Anyway, here's "Jennifer Garner" accepting the Popcorn for Best Breakthrough Female in Daredevil. P!nk's wardrobe might be malfunctioning - hard to say for sure - but it's definitely not impeding her performance of "Feel Good Time." P!nk tries to figure out if her backup dancer is real during a performance of "Feel Good Time." She is. P!nk's license plate is totally inappropriate. Victoria and David Beckham come all the way from space to present a giant gargoyle to nobody. Many years after her Vampire victory and definitely all-growns-up, Kirsten Dunst beams as she accepts Best Female Performance for Spider-Man. She also wins Best Kiss. Demi Moore "forgets" that it's a felony to open Eminem's mail. He forgives her when he finds out he's won Best Male Performance for "8 Mile." After what went on in American Pie, Alyson Hannigan and Jason Biggs are way too nervous to make eye contact as they present the award for Best On-Screen Team. 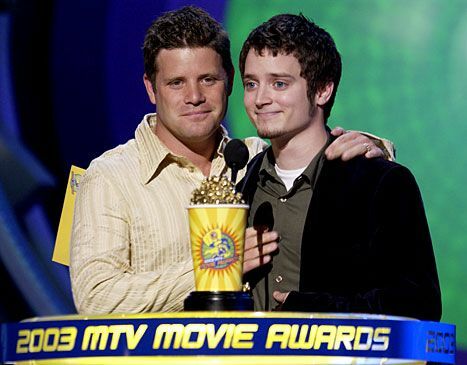 Sean Astin checks for Elijah Wood's heartbeat to make sure that the shock of winning Best On-Screen Team for Lord Of The Rings: The Two Towers hasn't killed his little buddy. t.A.T.u. perform at what we assume is a totally normal birthday party for girls in college. Right? Undercover scientists Beyoncé Knowles and Johnny Knoxville present the award for Breakthrough Performance Male from their machine room. 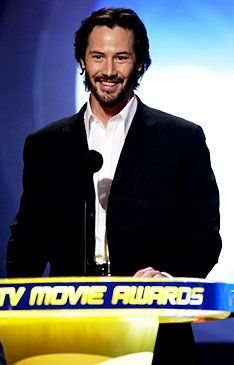 Keanu Reeves' beard presents the Golden Popcorn for Best Movie. Sorry to ruin it, but the winner is Lord Of The Rings: The Two Towers. Just thought you should know. 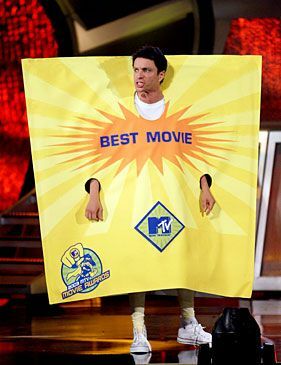 Chris Kattan, dressed here as a giant Best Movie envelope, usually gets the last laugh. 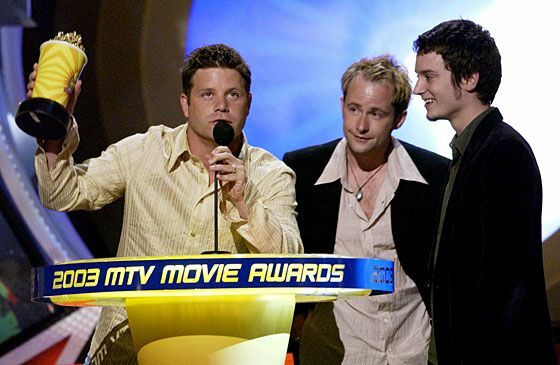 Sean Astin responds to chants of "Rudy" by looking skyward as he, Billy Boyd and Elijah Wood accept Best Movie honors for Lord Of The Rings: The Two Towers (told you).